Jesus clearly answers us: “Peace I leave with you; my peace I give you. I do not give to you as the world gives. Do not let your hearts be troubled and do not be afraid” (John 14:27). 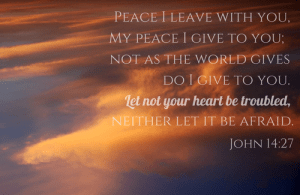 The world outside may be a raging storm, our inner world may be a tempest–but He gives us peace from it all, if we are willing to let Him into our hearts. The Lord gives us this promise when winds blow, lightning strikes, hail falls, floods rise, inner thoughts assail in our moments of uncertainty and fear: (6) Do not be anxious about anything, but in every situation, by prayer and petition, with thanksgiving, present your requests to God. (7)And the peace of God, which transcends all understanding, will guard your hearts and your minds in Christ Jesus (Philippians 4:6-7). Jesus is the “Wonderful Counselor, Mighty God, Everlasting Father, Prince of Peace” who gives us refuge from the storms of life (Isaiah 9:6). The only way we are removed from this peace is by our own doing– when our faith is weak, when we fear a sinful society seems beyond redemption, when our internal thoughts become ridden with doubt. Through all of this, we limit God, and His peace cannot reach us. The giving end from God is always powerful and strong; the faulty transmission comes at the point of reception– you and me. Previous PostThe Master Teacher’s ClassroomNext PostHEAR MY VOICE: I WANT TO LIVE!